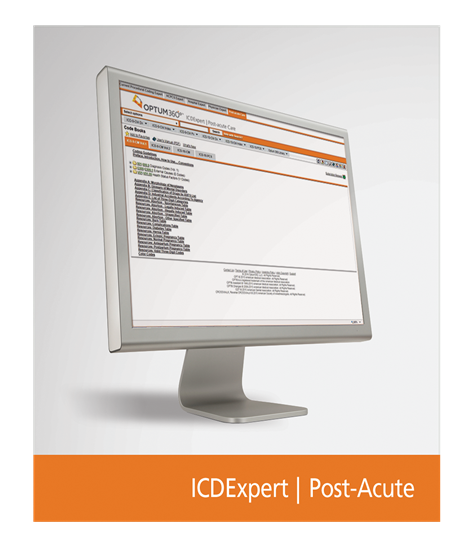 ICD Expert for Post-acute Care with our hallmark features and content is designed specifically to address the challenges faced by home health, hospice, skilled nursing, and rehabilitation services using ICD-10-CM and PCS coding and reimbursement systems. This valuable online solution delivers every description, guideline, and instruction in Expert code books, but in a more convenient format and just as affordable. Updated monthly, ensuring code descriptions and clinical information are always current, and helping you comply with HIPAA. Use as a complement or replacement for your coding book. Optum360 Edge—Color-coding and symbols specific to the home health PPS edits. Quickly identify coding and reimbursement issues specific to home health for improved coding accuracy and work efficiency. Optum360 Edge—Color-coding for hospice non-cancer diagnosis codes. Know at a glance which diagnosis codes qualify a non-cancer patient for hospice care. Notations for diagnoses that group to clinical dimension. Expedite identification of diagnoses that groups a patient to expanded clinical dimensions case mix groups to ensure appropriate reimbursement. Non-Routine Supply (NRS) diagnosis alert. Every condition that may qualify to receive non-routine supply reimbursement adjustment is identified. Manifestation code alert. Properly use codes that represent manifestations of underlying disease by knowing when two codes are required and by knowing alerts to sequencing rules.